The media have called him many names: "The Happiness Catcher", "extremely charming" or simply stated that he possesses "a once in a generation unique photographic vision". Still, Stephan´s work defies any single category. 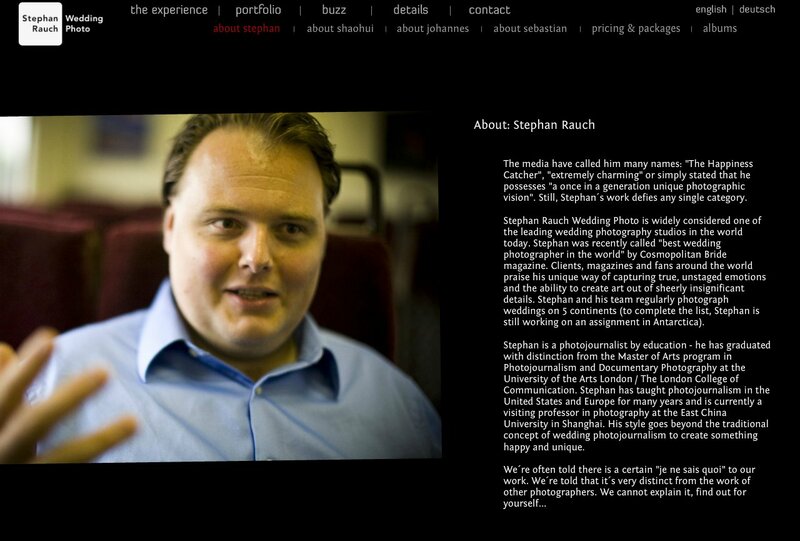 Stephan Rauch Wedding Photo is widely considered one of the leading wedding photography studios in the world today. Stephan was recently called "best wedding photographer in the world" by Cosmopolitan Bride magazine. Clients, magazines and fans around the world praise his unique way of capturing true, unstaged emotions and the ability to create art out of sheerly insignificant details. Stephan and his team regularly photograph weddings on 5 continents (to complete the list, Stephan is still working on an assignment in Antarctica). Stephan is a photojournalist by education - he has graduated with distinction from the Master of Arts program in Photojournalism and Documentary Photography at the University of the Arts London / The London College of Communication. Stephan has taught photojournalism in the United States and Europe for many years and is currently a visiting professor in photography at the East China University in Shanghai. His style goes beyond the traditional concept of wedding photojournalism to create something happy and unique.